A common to abundant, yearlong resident in deserts of southeastern California. In the Colorado Desert, inhabits desert riparian, desert wash, desert scrub, and alkali desert scrub habitats from the Mexican border through Imperial and Riverside cos. to southern San Bernardino Co. Less common in the Mojave Desert; inhabits Joshua tree and desert scrub habitats west to Antelope Valley (Kern and Los Angeles cos.), and north into Inyo Co. Formerly abundant in southwest to San Diego Co. (Grinnell and Miller 1944, Garrett and Dunn 1981). Feeding: Gleans insects from foliage and twigs of shrubs. Also eats berries and seeds (Bent 1946). Cover: Seeks cover in thorny, desert habitat, frequently in mesquite, catclaw, and palo verde. In the northern part of its California range, frequents creosote-bushes and Joshua trees. Occupied baccharis and tree tobacco shrubland in San Diego Co. until recently. Reproduction: Weaves oval, enclosed nest of twigs and thorns lined with fine grasses, dead leaves, spider webs, feathers, and plant down. Nest placed conspicuously in shrub near end of branch. A male may build several nests; female chooses 1 (Bent 1946). Nest often used as roost. Water: Apparently not dependent on water, but often inhabits desert washes where vegetation is thicker than on open desert plains. Pattern: Found in desert riparian, desert wash, desert scrub, and other desert habitats with large shrubs and small trees. Seasonal Movements/Migration: A yearlong resident in California. Little movement reported, but may be found as a vagrant along the coast in San Diego Co.
Home Range: Mean home range in Arizona was 10 ha (25 ac) (Taylor 1971). Territory: Immediate vicinity of nest defended. In desert riparian habitat along the lower Colorado River in Arizona, mean territory varied from 1.3 to 1.7 ha (3.2 to 4.2 ac) in different study areas and years (Laudenslayer 1981). Reproduction: Breeds from late February to mid-June with peak activity in April and May. Lays 3-6 eggs; average 4. Incubation 14 days, by female or female and male. Altricial young fed by both parents; fledge in 21 days but return to nest to roost at night (Harrison 1978). Sometimes raises 2 broods a year. Niche: Eggs subject to predation from snakes and small mammals. Only a few cases of cowbird parasitism reported . Laudenslayer, W. F., Jr. 1981. Habitat utilization by birds of three desert riparian communities. Ph.D. Thesis, Arizona State Univ., Tempe. 148pp. Taylor, W. K. 1971. 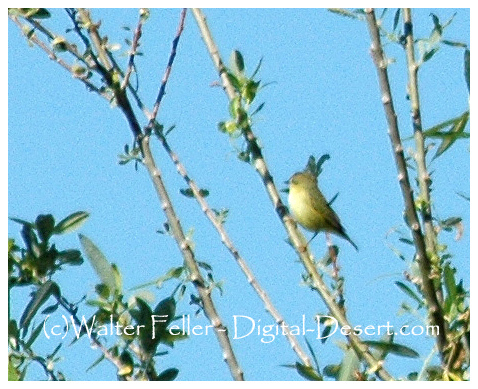 A breeding biology study of the verdin (Auriparus flaviceps) in Arizona. Am. Midl. Nat. 85:289-328.